History and Parts Pack Now Available for Kerbal Space Program: Enhanced Edition on Consoles | Take-Two Interactive Software, Inc.
NEW YORK--(BUSINESS WIRE)--Mar. 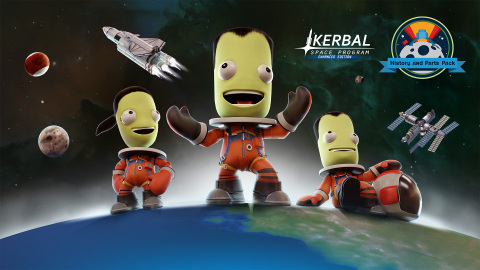 28, 2019-- Private Division, Squad, and BlitWorks today announced that Kerbal Space Program: History and Parts Packis now available for PlayStation®4 computer entertainment system and across the Xbox One family of devices, including Xbox One X. Kerbal Space Program: History and Parts Pack is the first downloadable content for Kerbal Space Program: Enhanced Edition,the console version of the critically acclaimed space flight simulation. The pack adds a variety of new content to the game, including 10 missions inspired by humankind’s most daring historical events, new parts to experiment with from the historic Space Race, and a fresh suit to enhance your Kerbal’s style. In addition, also included are new launch sites, including a Mun Launch Site currently only available in the console version of the game.